Mitsubishi Materials is proud to announce our ProTurn promotion! Buy 20 Inserts and receive 1 O.D. turning tool holder Free (double clamp or screw down types only). 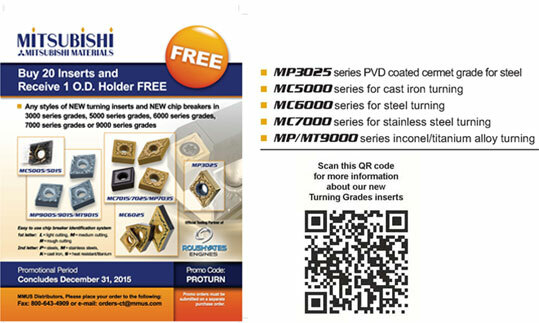 Any styles of NEW turning inserts and NEW chip breakers in 3000, 5000, 6000, 7000 or 9000 series grades are also included. Mix and match inserts and chip breakers, (10 of two different insert types and FREE holder-holder may also be different than inserts fit into). Specify promo code “PROTURN” on separate purchase orders to Fountain Valley Customer Service. To order e-mail orders-ct@mmus.com or Fax to 800-643-4909. All sales are final with no returns and blanket orders are not accepted for this promotion. Contact your local Mitsubishi Materials District Sales Manager for additional details. For more information of Mitsubishi Materials products please visit www.mmus.com.